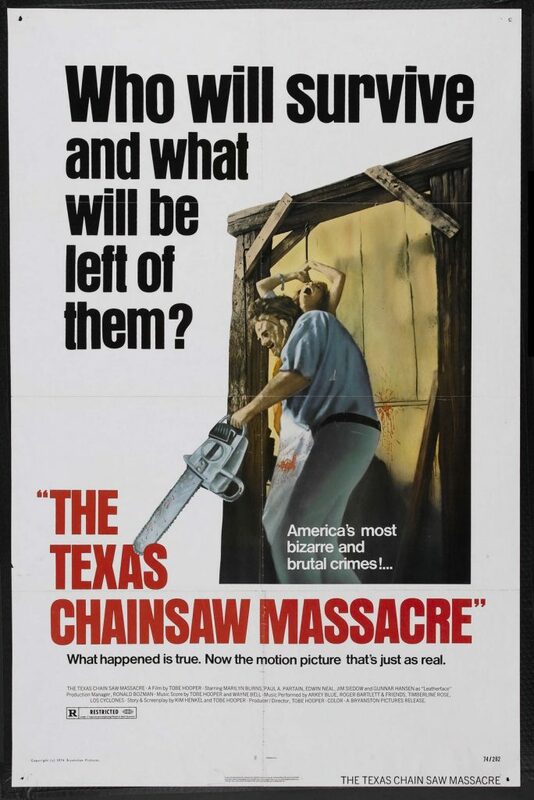 I have yet to encounter someone who doesn’t know of the 1974 horror classic The Texas Chainsaw Massacre. While you may not have seen it, you’ve almost assuredly heard of it. The film follows five teenagers on their way to visit a desecrated grave when they pick up a hitchhiker. They find themselves at the hitchhiker’s family home where they are thrust into a world of terror. The hitchhiker is the brother of a chainsaw wielding, cannibalistic serial killer called Leatherface, a name born from his grisly habit of creating and wearing flesh masks from his victims. The Texas Chainsaw Massacre was co-written and directed by Tobe Hooper, an American director, screenwriter, producer, and native Austinite. The film was made on a modest budget using amateur actors and filmed just outside of Austin. It is fitting then that a collection of materials from the film, including several props, reside in the Harry Ransom Center collections. Among these props is a mask created by art director Robert A. Burns. The masks of Leatherface were created to look like human flesh as they represented the faces of Leatherface’s victims. 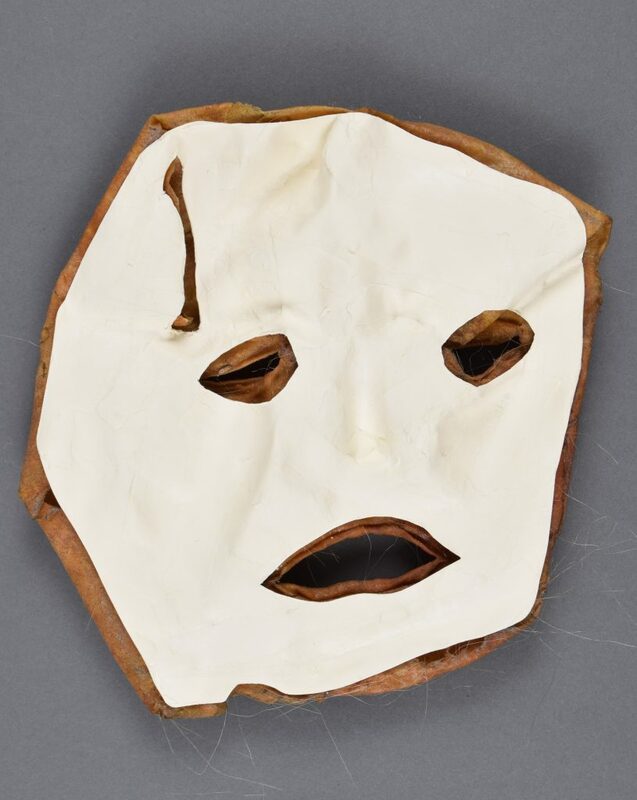 The mask in the Ransom Center collections is likely a test mask made by Burns as he experimented with different materials and techniques to achieve the final product. In order to achieve a lifelike texture, Burns used layers of latex rubber, mixing in a brown fiberglass insulation material into the liquid latex, and casting the mixture into molds taken from the faces of friends. His specific recipes, product brands, and additional materials remain unknown. On its own, latex will become brittle while the additives could potentially accelerate any chemical mechanisms resulting in the overall deterioration of the mask. 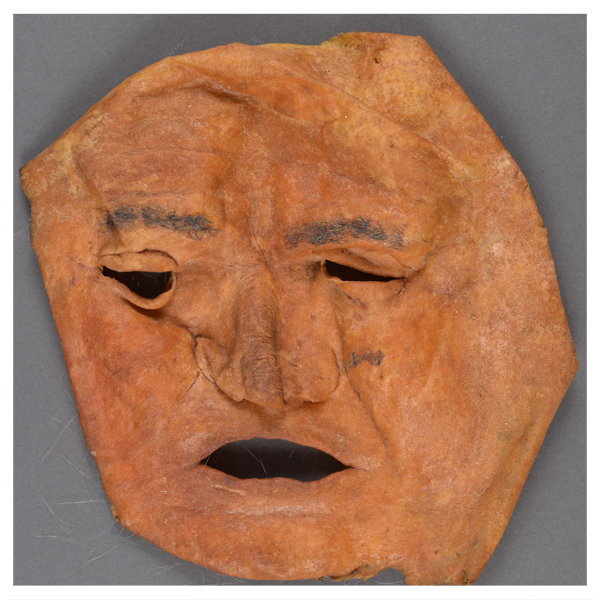 The goal of our conservation efforts was to preserve the mask as it is currently and to prevent further collapse or future breakage. The front of the mask. The underside of the mask. 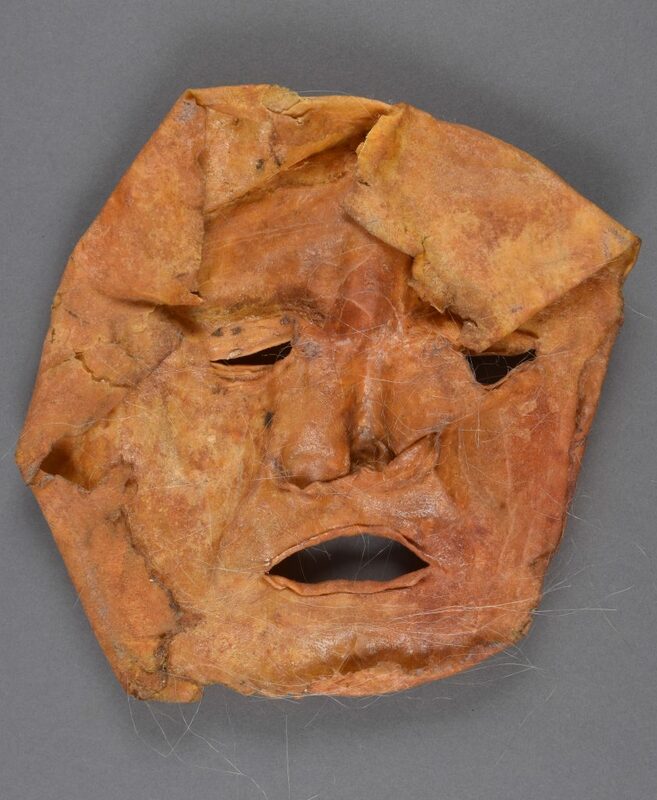 The mask had been stored flat in a box and had become brittle in this position over time. The mask is no longer flexible. Measures needed to be taken to prevent further deterioration and to reduce any undue physical stress on the original materials. We wanted a support that would rest underneath and conform to the distortions of the collapsed face. 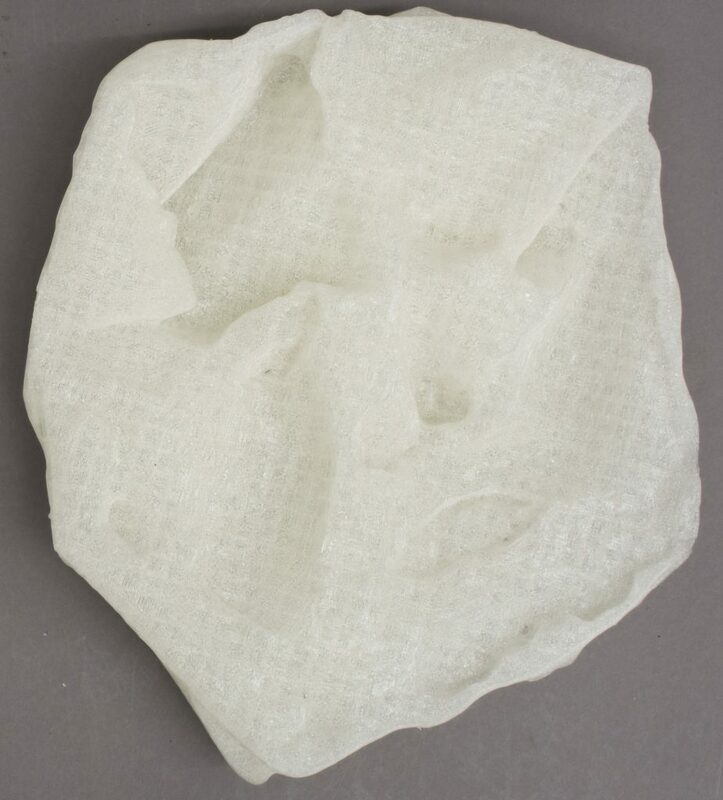 The mask, however, was too fragile to withstand the additional weight involved in casting a mold and too distorted to remove a cast without incurring physical damage like breaks and cracks. The challenge was how to make a custom housing for an item that’s too fragile and distorted. The solution: digitize it! 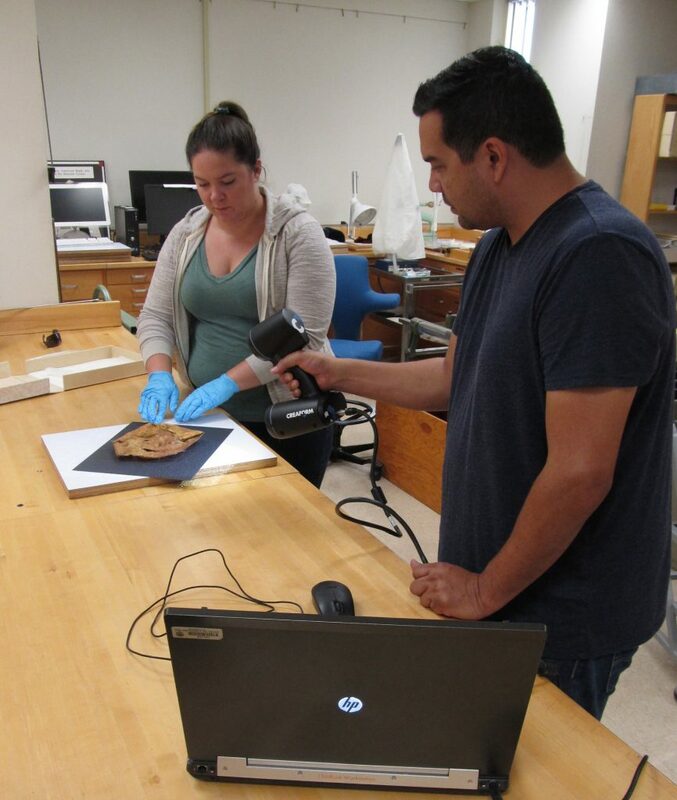 Jose Perez holds the Creaform Scanner while Morgan Burgess rotates the mask. Three-dimensional technologies allowed us to create a scale replica from which the customized support was made. In collaboration with the Digital Fabrication Lab in UT’s Art Department, we used a Creaform Go! 3D Scanner; a handheld structured light scanner that projects patterned light (like a QR code) onto the surface of the object, while a detector picks up deformations in the pattern caused by the item being scanned. The detected deformations allow the accurate triangulation of points as the information is processed by algorithms written for the scanner and proprietary software. The points are connected to form triangles which creates a digital mesh. More points and triangles within your mesh result in a high resolution or high-fidelity model. The digital model of the Leatherface mask was processed in VXElements, a proprietary software compatible with the scanner. The software offers a live view of the scanner’s data acquisition and generation of the digital model allowing the user to see its creation in real time. Once processed, the digital model was 3D printed in a Polylactic Acid (PLA) biodegradable thermoplastic filament with a Lulzbot TAZ 6 3D printer. The 3D printed model provided accurate dimensions of the mask. From the model, we were able to fashion a support that perfectly conformed to the topography of the brittle and distorted surface. First, a barrier layer of Glad Press N’ Seal was applied to the 3D printout to facilitate an easy release of the support. Next, small strips of acid free art paper were saturated with wheat starch paste and molded to the contours of the 3D form in a papier mâché method. 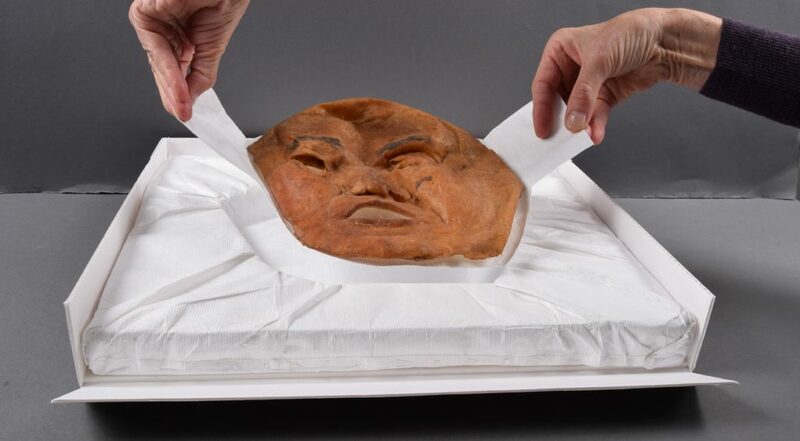 Once dry, the support was removed and tested against the original mask. Trimming at the eyes and mouth was done so that the support cannot be seen when viewing the mask, meaning that the support can remain under the mask at all times and under all circumstances – a decision made with future display in mind. Morgan Burgess trims the papier mâché support. The papier mâché support nested into the underside of the mask. 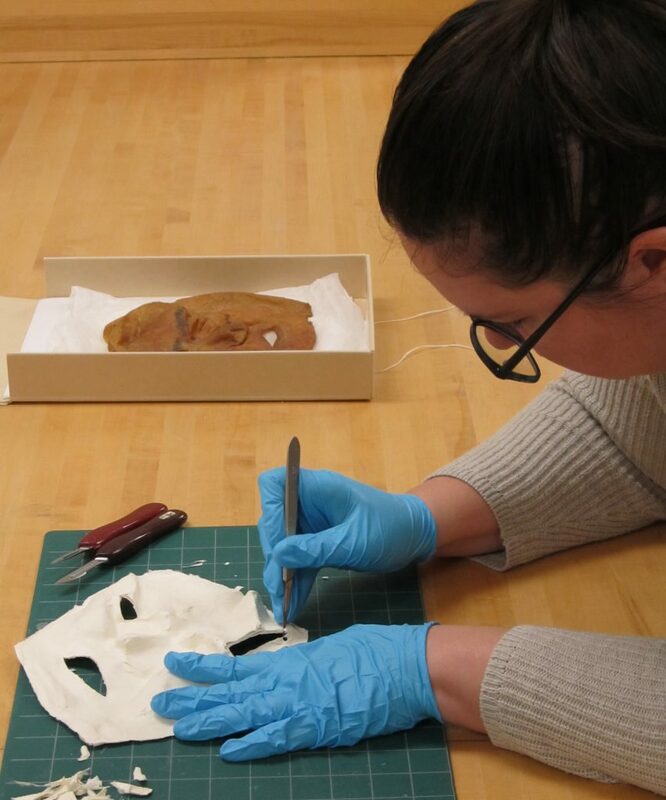 The Ransom Center’s preservation and conservation division undertakes a range of preventive measures, such as providing protective enclosures for collection items. Division staff design enclosures so that they both provide adequate support for items and assist staff and users in the safe handling of collection materials in storage and in the Reading and Viewing Room. Preservation technician Jill Morena created the final housing for the mask. Morgan Burgess is a Samuel H. Kress Fellow at the National Museum of American History. Morgan undertook this project under the supervision of Ransom Center Senior Book Conservator Olivia Primanis. This research was presented at the American Institute for Conservation of Historic and Artistic Works 46th Annual Meeting in Houston, Texas. I am curious about the use of wheat starch… will this not attract pests? Wheat starch paste is commonly used in book and paper conservation and while pests can be a problem for all types of collections, in a well climate controlled and monitored environment pests do not pose an imminent threat to the object. In weighing all our options, the safest was to use archival grade materials; there was no risk of off-gassing or chemical interaction between the mount materials and the mask. That is incredible! I’m fascinated by 3D printing and digitization in general. Nice work! Morgan, I’m producing a documentary about Robert Burns (rondoandbob.com). Can you please contact me. I’d love to talk to you more about this mask. Morgan, I’m producing a documentary about Robert Burns. I’d love to talk to you a bit about this project. I notice these stray wisps and strands on the inside of the mask. Could that be an indication of the fiberglass material that Burns used? Yes, they could very well be! But without confirmation through sampling and material analysis, we can’t be certain.